Cleaning is paramount and it is advisable to compile a regular cleaning timetable to ensure nothing is missed throughout the day. Schedule cleaning times and specific tasks to ensure your facilities are in tip top shape and make sure that they are checked regularly to ensure cleaning is being completed to a high standard. Ensure that you have a plentiful supply of toilet roll and soap available to your customers. There is nothing worse realising that there is no soap or paper towels in the dispenser having used facilities, so ensure that these are topped up regularly to maintain optimum hygiene levels. Cubicle accessories are often overlooked as non-essential items, but certain cubicle accessories like toilet roll holders can make a big impact on the overall levels of hygiene in your establishment as they keep the toilet roll elevated off the floor while also make it easy to reach. 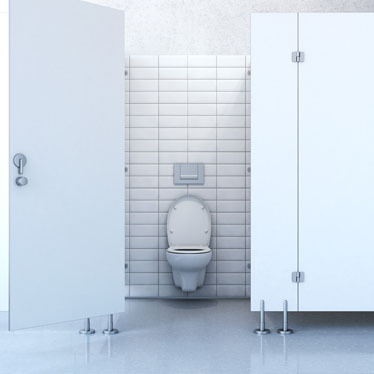 For more details on how best to maintain your cubicles why not read our previous blogs, Keeping Facilities Up to Date and Selecting Cubicle Hardware?